It's mid-June and the Summer Equinox is a week away. My vegetable boxes have little to show for the time of year. 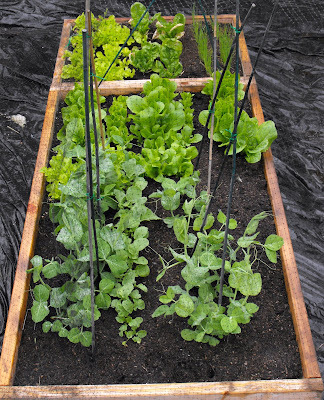 The cool spring has made the lettuces, spinach, green onions, radishes and snow pea's happy. I have kept netting over the veggies as I fear the masses of birds that enjoy our feeders. Also, after I put up the netting, I saw a reduction in slug attacks. I recently created some supports for the snow peas and that also helped raise the netting. My snow peas did fine without supports last year, but it was fun to do. If you notice in any of my photo's that it looks wet, well, it was. Yes, I garden in the rain, as the blog name suggests..because if I do not, I would never get any work around the gardens done this year! My tomatoes are growing. The larger is 'Sweet 100' cherry tomato, perfect for the husbands salads (I do not like tomatoes myself..can you believe it?!) I am also growing 'Beef Steak' because the name sounded cool :) Despite the cool temperatures they are surprising me with blooms and growth. I also put egg shells around the tomatoes. Honestly, I don't know why I did, but I read somewhere that you should. Thoughts? I also tried to do a little companion planting and am growing the baby finger carrots near the tomatoes. I am growing bush beans. I neglected to write down the variety. They are not doing well. It's been cool and sunshine has been spotty at best. 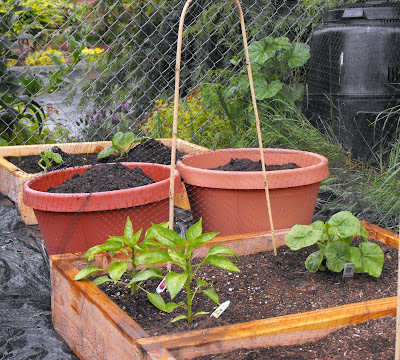 Here is a shot of my bell peppers and potato pots. I am attempting to grow a red and orange bell pepper varieties. To the right of them is a baby pumpkin plant. Behind them I am attempting to grow California White potatoes. I have covered them up once so far. Clearly I had no idea early on that I should have started them lower in the pots as they are now quite full of dirt. Beginners error! Behind the potato pots is a small bed with two hills of Howden pumpkins with Walla Walla sweet onions. Here is a sad fellow. Clearly this variety of cucumber require more sun and heat. A few of the leafs look better than the others. Hoping it will bounce back. Also the Butternut Squash is failing. Only one out of three starts is making a go of it. It's no surprise that the cool weather vegetables are happy. I have another sowing of spinach getting ready. 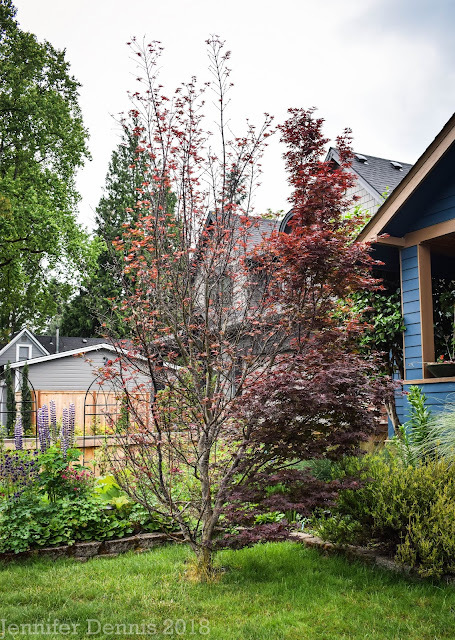 It's not uncommon to get a lot of rain in the Pacific Northwest. The cool temps this year have really created a snag in how early the warm weather veggies could be started outside. I think I would like to create a hoop house or get a small green house in the future to give these plants needed heat in the early season. It's been a lot of fun to experiment with vegetable growing. The specialty garden soil that I purchased has really make a significant different for the better. Bye Bye rotten clay! Despite the cool and rainy weather, I really have enjoyed all of the work I've engaged in to build these boxes, haul the soil down to them and the planning / plotting of designing my vegetable garden. It's such a welcome break from the work week and my kiddos have been at my side, learning along with me. My butternut squash starts kicked the bucket. I'm sorry yours are not doing well, but I'm glad it's not just me! I think the eggshells for tomatoes are because tomatoes like a lot of calcium? My squash plants look pretty similar to yours. I'm still holding out hope though :) Your cool weather veggies look very good. I'm thinking about trying some sort of hoophouse or tunnel to get a longer growing season. This is definitely my year of learning about vegetable gardening. Last summer I re-planted my lemon cucumber 3 or 4 times. I haven't planted them in the garden yet and am trying to start them in pots. They aren't sprouting yet, too cool out. I'm hoping this coastline warms up soon. Yeah, this weather is really putting a damper [pun intended] on the warm-season crops. I know Di from Voice in the Garden uses a hoop house and she's got lots of crops. Maybe one is in your future too. BTW, calcium helps prevent blossom end rot on tomatoes. I learned this in the Master Gardener course. I've heard that you should put finely crushed eggshells into the planting hole when you plant your tomato. Last year my squash, melon and cucumber plants all looked very like yours, and I never got anything from them, so I didn't even bother with them this year. My tomatoes are doing well under the hoophouse, I have lots of growth and lots of flowers. I have a bunch under Wall-o-Waters, which are also doing well. My hoophouse is not the sturdiest thing, but it was easy to put up and seems to be working. The cool weather crops look great in your garden, kudos to you for doing so much hard work getting those raised beds in shape. The hoop house we erected has definitely helped the peppers and tomatoes. I like your idea of the screening...somehting I plan to do also. Eggshells prevent end rot on tomatoes? I'll definitely try that! Your beds look so great! it will be nice to wander among them in july and august and harvest things here and there. I like your mud free walkways! We have completely given up on tomatoes and it's a good feeling to be free of the strife! I have a pumpkin on the window sill because we're waiting for the delphiniums to finish blooming and put them out there among them somewhere. It may be a good thing he hasn't gone into the ground yet - it's so wet out there - not so much from rain but endless mist!! I grew a Sweet 100 tomato last year, and it was *insane*. I hope your hubby really really likes his tomatoes, because it should give you hundreds! You know what? These rasied beds are looking just fantastic! All in all, everything looks very health and it growing - and it's been such a crazy spring so far. I'm enjoying watching your garden grow. 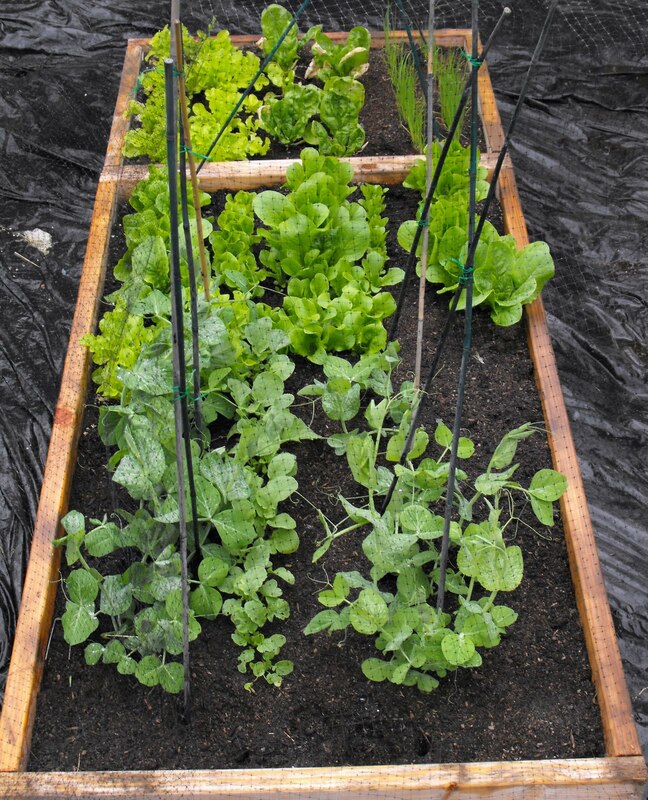 Your cool weather veggies look great! I hope the sun comes out for your other veggies. I think it great for your first effort! The kids will have great memories. 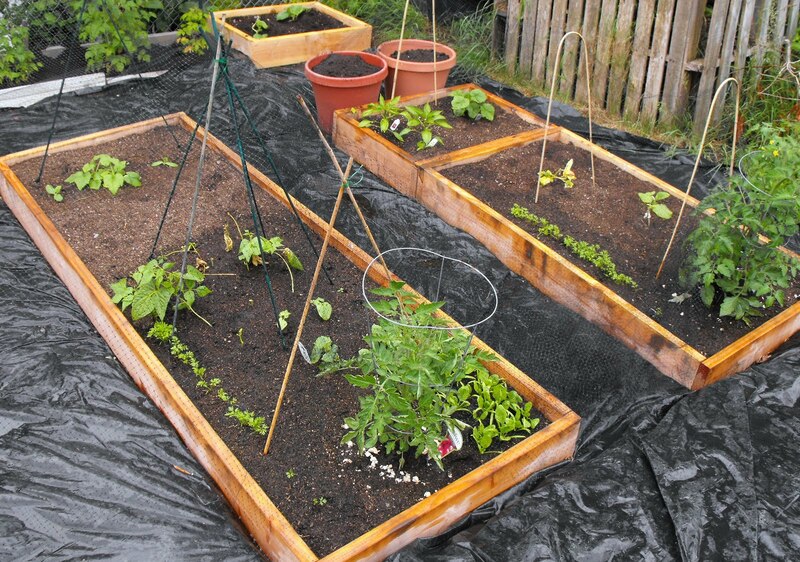 @Grace & Alison..yes, I need a hoop house. @Hanni, I'm glad I guess right on which cherry tomato to get..hope hubby will be happy later! 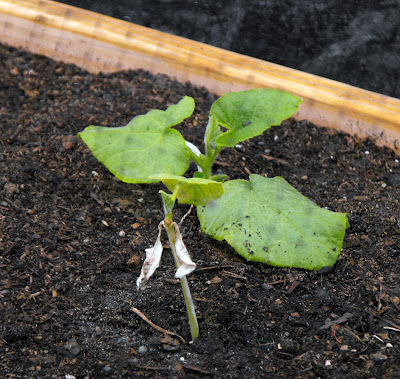 You've got a great start with all your veggie beds, despite the weather. You really have quite a variety of veggies you're growing--good for you! Hope you have bountiful crops! We all learn from our mistakes Jenni. I can imagine clay soil isn't ideal in small beds but our plot is on clay soil and once it has been worked and organic matter dug in it is very fertile. Your veggies look great, especially considering our weather. 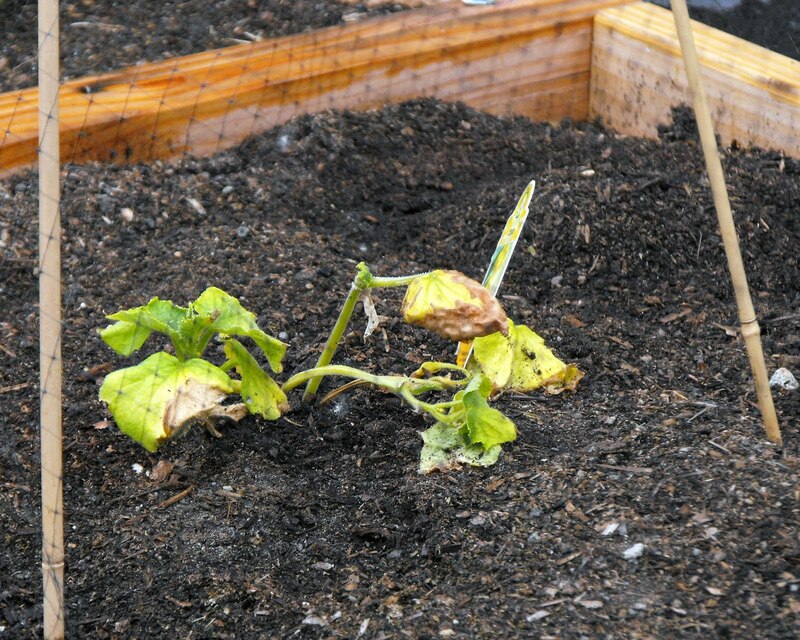 I've seeded Blue Lake bush beans twice and both plantings have rotted. My Royal Burgundy bush beans are doing great and others in the PNW have said the same. Thought I'd mention it in case you want to try them. @SG..oh yes, thank you for mentioning because I bet I have blue lake and they are just suffering. I will look for the ones you have mentions! Greatly appreciated! Your raised beds do look very professional. There's something about them that sets veg off so well visually. Pity about your squash. I'm still nurturing mine inside, because we've had forecasts of night frost a few times lately. Would you still have time to start another batch inside and have them catch up later in the summer?